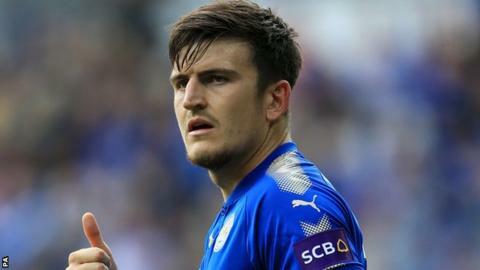 Harry Maguire has the potential to be a future England captain, says his Leicester manager Craig Shakespeare. Centre-back Maguire received his first international call-up on Thursday, for September's World Cup qualifiers against Malta and Slovakia. The 24-year-old, who joined the Foxes from Hull for £17m in June, is one of two debutants in the squad, alongside Watford midfielder Nathaniel Chalobah. Shakespeare said it was "the recognition he deserves". "He has impressed everybody with his ability but also his character," Shakespeare added. "We are all delighted for him and he can be pleased with his overall performance since he's been here. "His communication with the back four has got a lot better and he's improving generally. He seems very level headed. It is something that has come along quite quickly for him but I'm sure he will take it in his stride. "I don't see why he couldn't be a future England captain." Harry Maguire - best signing of the summer? Meanwhile, Foxes striker Leonardo Ulloa has signed a new two-year contract, eight months after handing in a transfer request. In January he vowed never to play for the club again and said he felt "betrayed" by former manager Claudio Ranieri. But after signing his new deal on Thursday the Argentine said: "Now I have to fight to play. I will train and give my best. I appreciate it a lot to stay here and I am so happy here now." Ulloa, 31, has made 96 appearances and scored 20 goals for Leicester since joining from Brighton for £8m in 2014.